Some things remain constant in this house. Mainly, the constant activity…its never quiet. If it is, something is fishy…as in wrong. + It may seem completely ironic but our CAT got caught in one of our MOUSE traps yesterday. I figure it is either one dumb cat or one smart mouse. Thankfully Emerson heard Izzy shuffling around with her two hind legs and tail bound to the Gorilla Glue trap we had set in the basement. After a terror of tears (by our oldest son), we carefully removed her from the confines of entrapment. + I am not a hairy woman. Well, honestly, my chin has some coarse, dark hairs that seem to grow overnight randomly. But all in all, hair isn’t the main issue. However, as I was bathing yesterday my dear daughter, Emerson, said, “Mom, do you have fur in your pits?” Calgon…take me away! + While Nate and I were meeting with a potential bride, Campbell came into our closed meeting space SCREAMING. I naturally figured she had been pushed, hit or shoved. But no…she had put a staple through her finger. Let’s just say…we didn’t wind up booking that wedding! + After forgetting something repeatedly, Briggs said, “Mom, maybe you should just put a post it on your forehead!” to which all of the kids laughed hysterically. + Does nail polish mean it is for your nails? Really? The twins thought it would look pretty on their faces. Ugh! + Briggs downloaded a ‘Spin the Bottle’ app (child-friendly) and we played on the kitchen floor. It was funny…but I don’t recall it being so innocent when I played. Nonetheless, we had a lot of laughs. + The arguing and name calling has reached a maximum limit this winter as we are in hibernation within the confines of our home. It finally prompted a Saturday morning Family Meeting. I heard in Bible Study, that our words should be like gifts we give to one another in a silver box. I am trying desperately to remind my children to speak kindly. 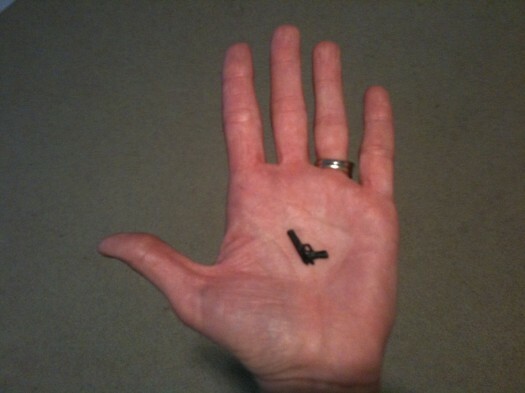 + It is hard to believe that this little gun that is less than an inch long could cause me to separate the boys. It goes to show you that we all can fight over the littlest things.